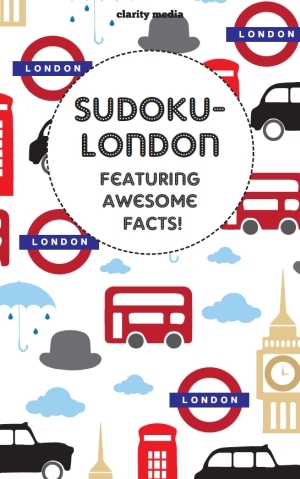 It's Sudoku... with fascinating London facts! Featuring 100 traditional sudoku puzzles and 50 fantastic facts in a handy pocket size, this book is a great way to learn more about the city of London, whilst sharpening up on your puzzle solving skills! Puzzles are staggered in levels easy, medium & hard so you can slowly build up to becoming a sudoku solving pro, learning lots of unusual and interesting facts along the way. Did you know that if you unrolled the London Eye, it would be the length of 4 football fields?! How about knowing that there are 1000 bodies buried under Aldgate station in a plague pit built in 1665? 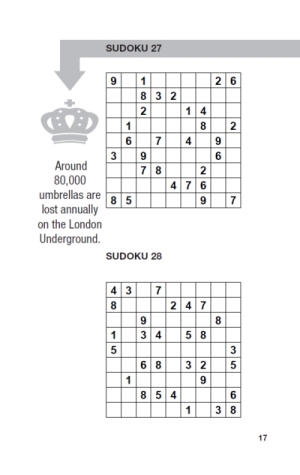 For lots more fascinating facts and brand new 9x9 sudoku puzzles, click the links to amazon below to get your copy now! This is a book of classic sudoku, so the rules are the same as always: place 1 - 9 once in each row, column and 3 x 3 box, and enjoy the interesting facts about London at the same time. Use the standard solving rules: look at which number can go in each square, and where each number can be placed in a region. You might also need to look at pairs and sets, but nothing harder: most puzzles are of medium-level difficulty in this novel book that makes a fantastic gift or souvenir for tourists. If you enjoy this book and would like to see a similar sudoku book produced on a different city or town, or have any other ideas you'd like to see a book of relating to puzzles, then please do just let us know - use the contact us link and we'd be delighted to hear any thoughts or ideas that you may have!